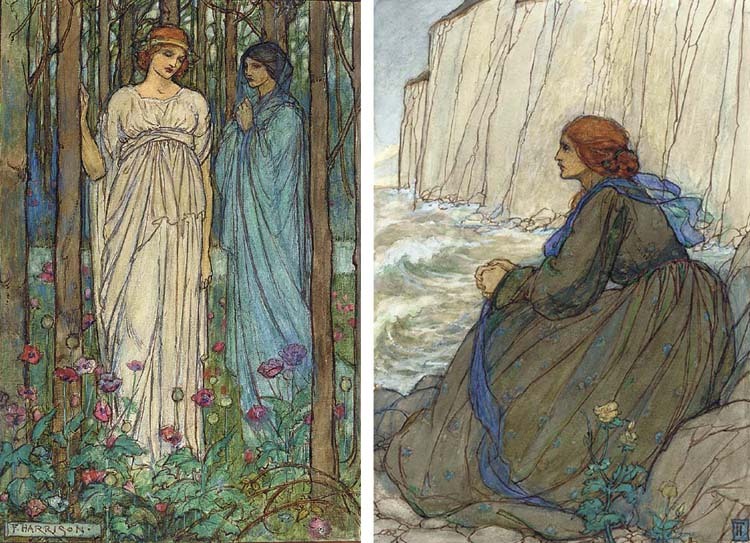 A writer of verse, Florence Harrison also illustrated poetry and children's books, in a Pre-Raphaelite manner. Her early works combined the influence of Art Nouveau with characterisation similar to that of Randolph Caldecott. Her verse had a romantic and magical quality that appealed to all ages. Examples of her illustrative work include C. Rossetti, Poems (1910), A. Tennyson, Guinevere (1911), W. Morris, Early Poems (1914), Rhymes and Reason (1905), Elfin Song (1914) and The Man in the Moon (1918), some illustrations from which are offered below. We now know that the artist was not "Emma" Florence Harrison, but rather Florence "Susan" Harrison! Two completely different ladies.